The Opportunity Zones are meant to spur economic development and job creation in distressed communities by providing tax benefits to investors. Investors receive capital-gains tax deferral, reduction in basis for long-term investments and other tax incentives. Investments made by individuals through Qualified Opportunity Funds in these zones would be allowed to defer or eliminate Federal taxes on capital gains. You can get the tax benefits, even if you don’t live, work or have a business in an Opportunity Zone. Investments are not administered or overseen by the City of Oakland. In Oakland, 30 census tracts were designated by Governor Jerry Brown as qualified Opportunity Zones for the next 10 years, through 2026. To check if a specific Oakland property is within a designated qualified Opportunity Zone, please enter the address in the State’s interactive map. Guidelines for implementation of the Opportunity Zone tax benefit are still being finalized by the U.S. Treasury Department, the federal agency that was charged with overseeing the tax benefit. The City is preparing a list of projects that are eligible for Opportunity Fund investments and will host public informational workshops on Opportunity Zones. Visit the City’s Major Development Projects page to see the variety of investment occurring in Oakland. 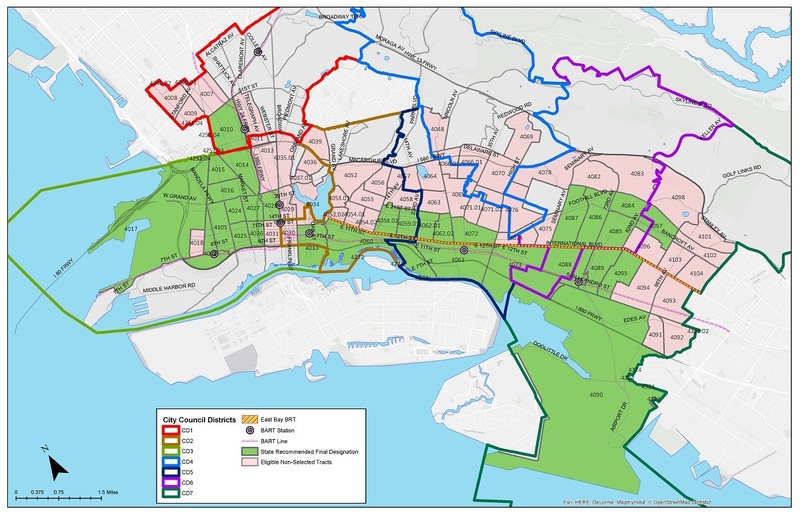 Learn about AC Transit’s Bus Rapid Transit project which traverses many of Oakland’s Opportunity Zones. For more information on Oakland's Opportunity Zones, contact Marisa Raya.